As previous reported, New Providence Middle School has received the distinguished award of being chosen a Positive Behavior Support in Schools (PBSIS) Model School by the New Jersey Department of Education–Office of Special Education, in collaboration with The Elizabeth M. Boggs Center, UMDNJ – Robert Wood Johnson Medical School. 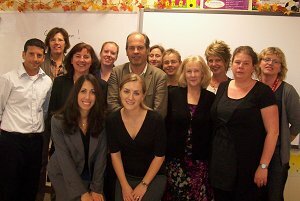 As part of this award NPMS recently hosted a group of Administrators from Dutch schools in the Netherlands. The Administrators were interested in examining the practices and interventions schools in New Jersey are using to address an increasing population of diverse student needs; the primary emphasis being on disabled students functioning in general education settings. A variety of NPMS teachers, counselors and administrators met with the guests during their visit to explain the strategies used to foster positive behavior in schools.